Originally from East Gippsland, Victoria, Kath graduated from the University of Sydney with first class Honours in 2005. Kath practiced in mixed practice for 3.5 years before establishing Northern Rivers Equine Vet Clinic (NREVC) in Kyabram. She completed the University of Sydney Post Graduate Foundation Equine Surgery course in 2008, was president of the Young Members Group of the Equine Veterinarians Association in 2007-2009 and attended the Jean-Marie Denoix Ultrasonography workshop in 2011 in Sydney and the advanced ultrasonography workshop in 2013 in Melbourne. She is an Academic Associate of the University of Melbourne and NREVC welcomes students from Melbourne University Veterinary Science degree on their rotations. Kath has a keen interest in race horses and is very passionate about keeping your race horse sound and on the track racing to its best ability. 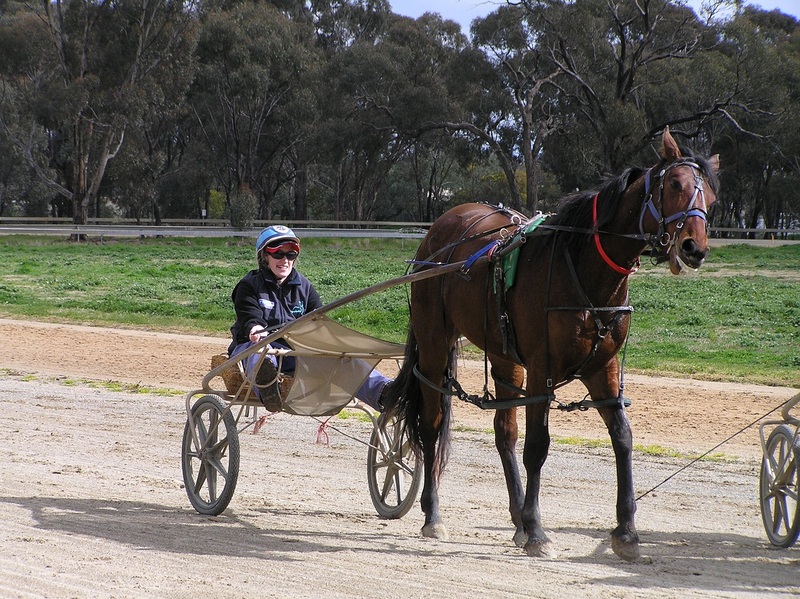 She has also recently received her Harness Racing Trial Driver Licence and hopes to obtain her full racing licence soon. Kath has a genuine interest in the Harness Racing Industry and was also Assistant Manager under John Coffey at Alabar Bloodstock Australia from 2011-2013. She owns several race horses both thoroughbred and standardbred. Her other interests also include surgery, wound management, foal and stud medicine, ultrasonography and lameness evaluation. Kath’s other interests include sport (participating in triathlons in her spare time), reading, movies and the beach and surf in summer. Now with husband Luke, a lot of Kath's spare time is taken up with daughter Heidi, as well as developing the 78 Gray Road farm & Equine Facility. and finally after years of begging her parents, she began riding at 8 years old. Since then she has never looked back. internship in Waikato, New Zealand where the heart of their thoroughbred industry lies. In her spare time she enjoys getting out and going for walks to explore places. Traveling is a passion, as is meeting new people and making friends. While in Victoria Cáit hopes to find the time to get back into horse riding. Josh joined the NREVC team in February 2015. He is a local to Echuca and now has a small property in Bamawm where he lives with wife, Michelle and children Jayden and Lily. Josh also has experience in the thoroughbred industry with Yearling Preparation and sales attendance with studs that have direct links to horses such as Kinston Town, Kingston Rule, Subzero, Black Caviar, and Pierro. Josh’s passion for horses began at a much slower pace and now follows in his father’s footsteps showing and putting on demonstrations with Clydesdales including the Melbourne and Sydney Royal shows where he has had great success on the show arena. Josh is a former Committee person for the Victorian Working Draught Horse Assoc. and currently holds a position on the Commonwealth Clydesdale Horse Society’s committee. Josh cares for all the horses at our 78 Gray Rd property like they are his own and takes much pride in the handling and education of the foals that present each year. age and even today her family are still involved in the Harness Racing Industry, with her sister and brother in-law training locally. horses and representing her zone on many occasions. Prior to joining the team, Sam has more recently been working as a Farmhand on an Angus Cattle Stud in the Southern Highlands of NSW. and Callie a Stock Horse. She also loves spending time with her family and nephews. Hollie joined the NREVC team in June 2015. Originally from Romsey in the Macedon Ranges, she moved to the area in 2013 with her partner and young family. Hollie spent many years working for thoroughbred stud Eliza Park both with the horses and in the office. During this time she has gained vast experience in the veterinary and equine industry and in all aspects of office administration and management. Hollie is the go to person for staff and clients and looks forward to meeting and assisting clients with all matters.